I received a package of thinkThin Lean Protein & Fiber™ bars and a gift card to facilitate this post. All opinions are my own. So, I have a confession to make: I totally blew the whole “I’m going to lose weight before summer” goal that I set at the beginning of the year. Because I’m a total procrastinator, I’m scrambling at the last minute trying to at least shed a few pounds so I don’t feel so self-conscious in a bathing suit. I actually did pretty good this last month! Of course, prepping for surgery, then being in too much pain to eat helped. You know what also helped? 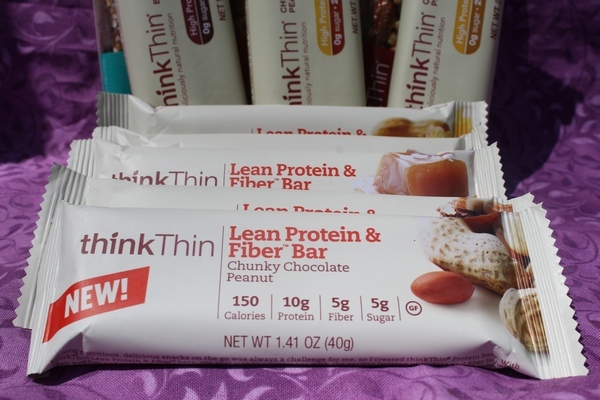 thinkThin Lean Protein & Fiber™ bars. Have you tried thinkThin Lean Protein & Fiber™ Bars yet? If not, you’re missing out. thinkThin Lean Protein & Fiber™ Bars come in several amazingly tasty varieties to help you satisfy your cravings and feel full without busting your diet. For me, they were fantastic for two reasons. First, the obvious: each bar contains just 150 calories yet is packed full of flavor and good stuff. With plenty of protein, they really help keep you going all day long. The second reason has to do with my surgery. Protein is incredibly important when your body is healing, but I was too exhausted and sore to actually make anything. The nurse also recommended that I try to eat six small meals and snacks rather than three big ones. thinkThin bars came in super handy during this time. I could just grab a bar, unwrap and get my protein. My absolute favorite of the Lean Protein & Fiber™ Bars is the Salted Caramel. From the delicious chocolaty coating to the sweet and salty creamy inside, it’s insanely delicious. In fact, all the flavors are so good that they make eating better a delight. Trust me, I’m like the pickiest eater on the planet aside from my son, so if I like them, they have to be good! The High Protein bars are certified gluten-free and the Crunch Mixed Nuts bars made from non-GMO ingredients. Every single bar is made from the highest quality ingredients. For more information, check out The Official thinkThin page. Follow thinkThin on Facebook, Twitter and Pinterest to keep up with news. 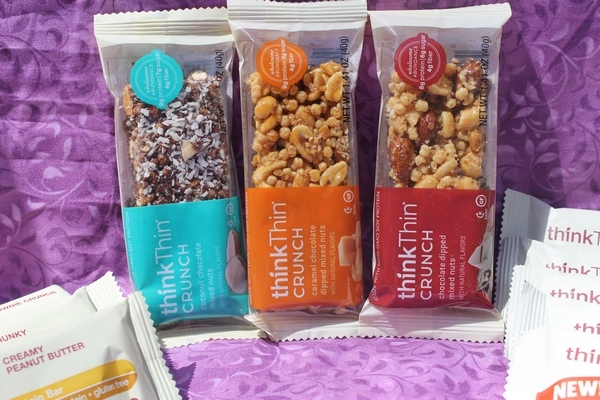 Enter below for a chance to win a variety of thinkThin bars like I received plus a $25 Visa Gift Card to put towards a new bathing suit for your new totally in-shape bod! Giveaway is open to US residents age 18+ and ends on 6/17. I want to try the Honey Drizzle Peanut Butter Bar. These bars sound so delicious! Honey Drizzle Peanut Butter Bar sounds amazing. I’d like to try salted caramel. I’d love to try the Caramel Chocolate Dipped Mixed Nuts. I will try Honey Drizzle Peanut Butter. I’d Like To Try The Honey Drizzle Peanut Flavor! Chunky Chocolate peanut sounds good. Salted Caramel or cinnamon bun white chocolate both sound delicious! I like the Brownie Crunch. I want to try the Chocolate Almond Brownie. I will try the Salted Caramel bar first. I’d like to try the High Protein Brownie Crunch. I would like to try the Cinnamon Bun. I am the most excited to taste the Honey Drizzle Peanut Butter bar. I would most like to try the Cinnamon Bun White Chocolate flavor. Thanks for the giveaway! Chunky Chocolate Peanut sounds so good! I would like to try the cinnamon bun white chocolate. I would like to try Brownie Crunch. Brownie Crunch sounds good to me! Id like to try the chunky peanut butter. I’d most like to try the brownie flavor! I would like to try the Brownie Crunch variety. Thank you!! I would like to try the Caramel Chocolate Dipped Mixed Nuts. Yeah chemicals are out of control. I’m dying to try the Salted Caramel! Thanks for the chance! Chocolate Almond Brownie sounds the best to me! Thank you for this chance to win. I wanna try the Cinnamon Bun White Chocolate Lean Protein and Fiber bar! Been looking to up my protein and fiber intake and this sounds like the perfect solution for it! I’d like to try the coconut chocolate mixed nuts bar. I would love to try the Salted Caramel of the Lean Protein & Fiber Bars. I agree Vince Vaughn is great actor I hope I like the movie. I’d like to try the caramel fudge. I would love to try the Divine Dark Chocolate Coconut Bar. The Chocolate Almond Brownie sounds amazing! Chunky chocolate peanut sounds the best to me, although I think they all sound good. I am looking forward to trying the Brownie Crunch. Sounds delicious! I would love to try the Chunky Chocolate Peanut. I’d most like to try Brownie Crunch! I would love to try the Honey Drizzle Peanut Butter flavor. The Divine Dark Chocolate Coconut bar sounds amazing!!! The chocolate Almond Brownie sounds delicious! I would like to try the Chocolate Almond Brownie. 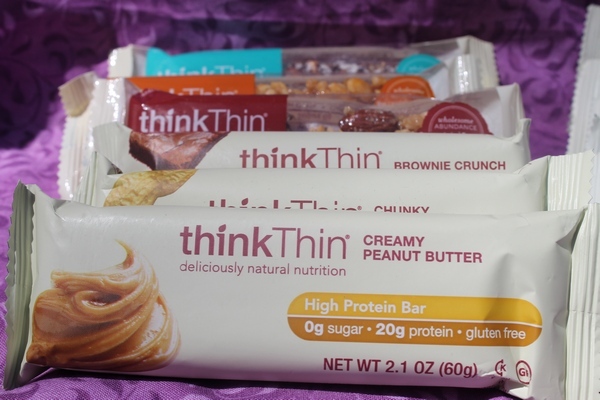 The first flavor from ThinkThin that I would like to try is the Chocolate Almond Brownie. My choice would be the High Protein Chunky Peanut Butter! I want to try Salted Caramel! The Brownie Crunch sounds delicious. I would try the Honey Drizzle Peanut Butter. I want to try the Chunky Chocolate Peanut. I would like to try the chunky chocolate peanut.